As I’ve mentioned in previous posts, I’m a dip and dressing fanatic. I have always especially been a fan of cool, creamy Ranch and Blue Cheese dressings. I’ve even been known to dip pizza in Ranch dressing on occasion (don’t knock it till you try it!). So you can imagine my surprise in the first trimester when the thought of cool, creamy Ranch made my stomach turn. What I craved instead was something tangy and zippy. Not that I haven’t ever liked these kinds of dressings before (because I have) but my obsession went to a whole knew level. I felt like I was literally just using salad as a vehicle to get that sweet, tangy, zippy dressing to my mouth. Mmmmm…. With such strong cravings you can imagine how disappointed I was when we ordered pizza and a salad and the dressing I ordered (and paid for!!) didn’t come. I’m embarrassed to say how upset I really was. I’m looking at you Dominos. Then of course I realized that I do love to make my own homemade versions of foods and that it was a bit silly to be that upset over something I could easily make on my own (but still a little upset, Dominos, your shaming isn’t over yet). 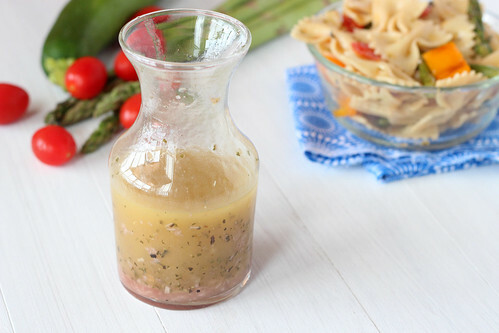 The awesome thing about homemade Italian dressing is that you can change it up to really fit your tastes. This is the recipe that’s been working for me lately. But of course you should taste as you go and add things as necessary. This particular recipe also made a killer roasted veggie pasta salad (which will be shared tomorrow!). Whisk together all ingredients and let sit for at least an hour (to give time for the flavors to meld together). Each time you use it, you will probably need to rewhisk or shake to mix it up again. The dry mustard only acts as an emulsifier for so long. 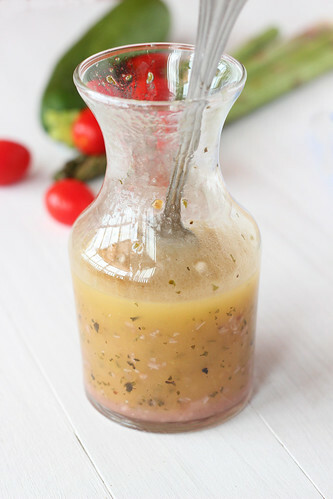 Check out these other DIY/Homemade sauces/condiments!